Researcher Kevin Colson with a collared Southeast Alaska moose. Most Southeast moose are the subspecies andersoni, or anderson's moose, while moose in Interior and Southcentral Alaska are the larger subspecies gigas, or Alaska moose. Why these different subspecies occur in different areas, and how they got there, is part of Colson's work. Moose are an Alaska icon, a massive animal reminiscent of the prehistoric beasts of the last ice age. In many ways Alaska is still emerging from the ice age, and the moose of Southeast Alaska are a good example. Moose did not colonize Southeast Alaska until the 20th century. Biologist Kevin Colson, a researcher with the University of Alaska Fairbanks, said Southeast Alaska moose provide valuable insights into moose genetics because they’re so new to the region. A strong genetic signal can provide insights into how regional moose populations are structured, as well as information about colonization routes, interchange between populations, and how local geography influences movement. Moose originated in Asia. They crossed into North America shortly before the Bering Land Bridge between Asia and America flooded about 11,000 years ago, and then dispersed throughout Beringia (prehistoric Interior Alaska and northwest Canada). About 10,000 years ago an ice-free corridor opened up between the huge continental glaciers that covered Canada, allowing animals like moose, grizzly bears and bison to move south from Beringia to the Pacific Northwest and into the continental United States. Moose subsequently evolved into four North American subspecies (and other subspecies found in Scandinavia and Russia). 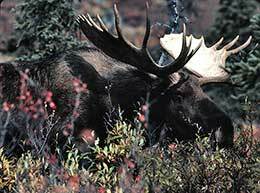 Alaska is home to the world’s largest, Alces alces gigas, as well as a smaller subspecies, Alces alces andersoni. Gigas, also known as Alaska moose or tundra moose, is found in Alaska, the Yukon and northwest British Columbia; andersoni, or anderson’s moose, is found in Southeast Alaska, the eastern Yukon, and central B.C. east to Michigan. Where these two subspecies occur in Alaska and why is particularly interesting to Colson. Colson has been studying Southeast moose since 2011 and worked with state wildlife biologist Kevin White on the Gustavus and Berners Bay populations. Moose in the Gustavus population exhibit noteworthy seasonal movements between winter foraging areas, calving areas, and summer foraging areas. Colson was particularly curious about calving. How do they decide where to have it? Do they decide to have their calves where their mother had them? Colson recently completed his masters thesis at the University of Alaska Fairbanks. His project focused on moose throughout Southeast Alaska but delved into the finer details of the Gustavus and Berners Bay populations. He used genetics to create a picture of how moose colonized Southeast, where the source populations may have come from and how these populations are related. Impeded by mountain ranges, icefields and glaciers, moose did not colonize Southeast Alaska until the 20th century. Moose are far more recent arrivals than Sitka black-tailed deer and wolves, which moved up the coast from the south about 8,000 years ago as the glaciers melted and land was exposed. Moose in Southeast Alaska are found in about 10 localized populations. Moose from British Columbia accessed Southeast via the river corridors through the coastal mountains and arrived in the Taku River valley south of Juneau and the Stikine River basin near Petersburg about 1910. Moose dispersed into the Alsek River area and the Yakutat Forelands in the 1920s and 1930s, and were first seen in the Chilkat River valley north of Haines in 1924. The population in the Chilkat River valley reached a population high of 700 animals in the mid-1960s. Moose dispersed from there down the Chilkat Range and reached the Gustavus Forelands in 1966. People introduced moose from Southcentral Alaska to Berners Bay north of Juneau in 1958 and 1960. Colson looked at genetic samples from 299 moose. He said Petersburg science teacher Joni Johnson and her students provided tissue samples from that area, as did Petersburg area biologist Rich Lowell. Colson collected some samples himself. “I was spending half my year following moose in Gustavus, trying not to get kicked in the face,” he said. Samples were also provided by hunters, other researchers and wildlife managers. 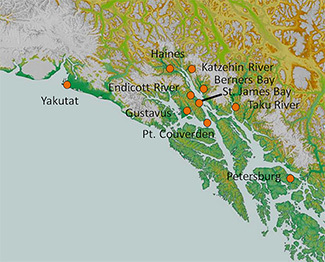 Samples came from Berner's Bay, Cordova, Couverden, the Endicott River drainage, Gustavus, Haines, the Katzehin River drainage, the Petersburg area, St. James Bay, Alaska the Taku River drainage, Yakutat, and British Columbia, Canada. Moose are not simply colonizing new areas, and then as their numbers increase, dispersing or stair-stepping into new, virgin habitat. They are moving back and forth, back into areas they formerly occupied. Colson raised an interesting point about Interior Alaska’s moose, based on work by UAF researcher Kris Hundertmark. “We strongly suspect that the moose in mainland Alaska either became locally extinct or were replaced by moose from British Columbia that back-colonized,” he said. These animals were the ancestors of the moose that diverged into the two subspecies found in Alaska and elsewhere, the Alaska moose and anderson’s moose. “The ones in BC became andersoni, and the ones that came back into Alaska became gigas,” he said. The moose in Berners Bay are the larger Alaska moose subspecies, because they were not natural colonists, but introduced by people from Alaska moose populations in Southcentral. Colson said it appears in some cases the localized Southeast moose populations grew from very small numbers of original colonists, possibly as few as one pregnant female. Some colonizations appear to have grown from just three to five animals. A genetically identifiable population could become established, and at a later date, other moose might come in, and their different genetic signal will appear in the offspring. That appears to be the case with the Haines area population. The location of the southernmost gigas population is, “The $10,000 question,” Colson said, but it appears to be the Tetlin, B.C. area, or the area between Haines and Tetlin. Haines is on the northern end of the Chilkat Peninsula, which stretches about 70 miles further south to Point Couverden. Its bordered on the east by Lynn Canal and on the west by Icy Strait and Glacier Bay. Ice fields, glaciers and rugged mountains define the northern end. An interior Alaska moose, Alces alces gigas, the largest of all moose subspecies in the world, also known as tundra moose or Alaska moose. It has been assumed that Haines moose dispersed south into the Chilkat range and established the populations there in the Endicott River drainage, as well as the populations at the south end of the range – the Couverden area, and then the Gustavus area populations near and in Glacier Bay. The moose are the anderson’s moose subspecies. It’s probable that Haines area moose were the source population. But Colson found the Gustavus and Endicott populations are different from Haines moose. One explanation could be that after Haines area moose dispersed to the south, new animals came into the Haines area and interbred. “It’s really confusing, and that’s interesting,” Colson said. He said it’s been long assumed that moose in the Yakutat region are the gigas subspecies, but Colson found something different. Anecdotal observations have suggested that moose moved into the Yakutat area from the Yukon via the Alsek River corridor, and the Yukon moose are thought to be the gigas subspecies. “More research should be done to look at morphology, skull size, and behavior,” Colson said. He said while the Alaska moose is the biggest subspecies, there are also differences in how the roof of the mouth, the palate, grows in; anderson’s was initially defined on bone definition of the palate. Another interesting and relevant difference is observational – the breeding behavior between the two subspecies. The Alaska moose forms large, classic harems. A bull will mate with as many as cows as he can, in classic rutting behavior. Anderson’s have more of a serial monogamy or “tending bond” approach: a cow will announce she interested, a bull will guard her until she enters estrus, mate with her, then move on to another. He may be challenged while he's guarding her and waiting, but he’s not gathering a harem. “These are two ends of a spectrum, there might be some blending, but by the time you get into the Copper River Basin you’re seeing distinct Alaska moose social behavior,” he said. Moose in the Petersburg and Taku River areas are anderson’s moose and exhibit the behaviors and characteristics classic to that subspecies. Observations of the breeding behavior of the Yakutat population could offer more insights. Future genetic work will also provide clues and a better understanding of how animals colonize new areas, adapt to their environment and interact. Riley Woodford is the editor of Alaska Fish and Wildlife News. Game Transplants in Alaska offers a wealth of information on the Berners Bay moose transplant and virtually all game and furbearer introductions on Alaska. 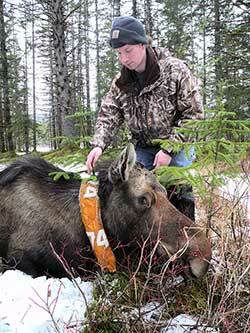 The moose species profile provides additional information on moose.